This weekend, the annual corporate schlockfest NHL All-Star Game takes place in Tampa Bay, where the best players from around the league…sorry…the best players from around the league to the degree where one player from each team has to be selected to play within the restrictions of having only 6 forwards, 3 defencemen and 2 goalies from each division (sorry Tarasenko et al) take to the ice to compete in the most non-competitive way possible to prevent any possibility of long-term injuries in a series of meaningless games. But hey, it’s a 3-on-3 tournament, so at least it will be watchable! Sorry, was this supposed to take the place of participating in the Olympics? Sheesh. 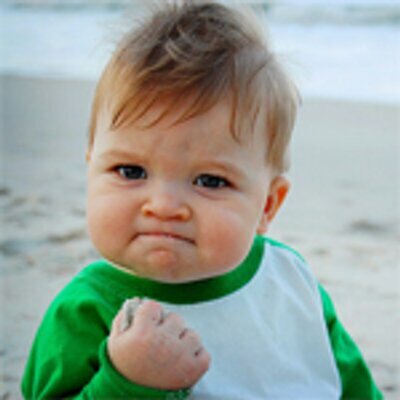 Okay, digression over. We’re here to talk jerseys, and a couple weeks ago, the league unveiled what the teams will be wearing during the ASG tournament. So, we’ll break them down after the jump. Here’s a quote from NHL.com regarding the jerseys/uniforms regarding the colours for the uniforms. …while a custom color treatment featuring the “energy” colors of UV yellow and solar red have been uniquely applied to evoke the warm, vibrant sunset tones and the energy of the Tampa Bay area. This is good logic. Blue and white just ain’t gonna work with four jerseys that need to work when any two of the four teams could play each other. To bring in something that is associated with Tampa Bay to fill out the rest of the jerseys (although, I’m not sure Tampa is the only place with vibrant sunsets) is a good call. What’s strange, however, is how all this logic was applied. 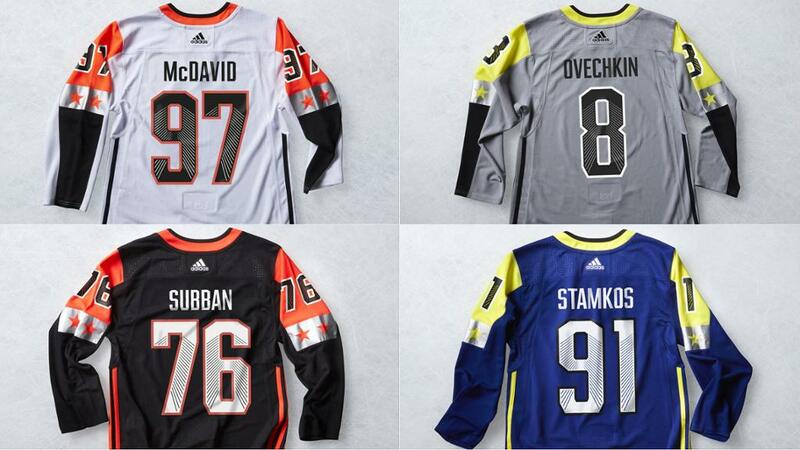 If we look at the 2017 ASG jerseys and compare them with this year, we can see a couple trends emerging. The base colour of the jerseys will always be based on the host team’s primary colours. Last year in LA, it was black, white, purple, and gold – and there will always be a black and white jersey (which given the 4-team thing, is logical) For Tampa, that meant bringing in that stretched piece of logic from above to accommodate this particular guideline to have a blue, white, black, and grey jersey. Another trend seems to be to incorporate other colours as the secondary colours on the uniforms. 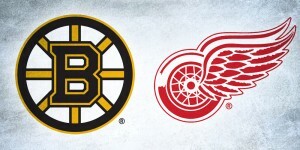 It’d be preferable if they were team-related, but if that’s not possible, it has to make sense for the host city. LA has enough of a diversity in their jerseys that their colours could be spread around. For Tampa, it meant bringing in the “energy” yellow and red, which gives the NHL a chance to re-introduce some neon-esque fabrics (remember 2015?). This time, it makes more sense, and the neon colours are applied better here. If you’re going to have a white, black, and grey jersey, might as well bring in some bright colours to give them some character. 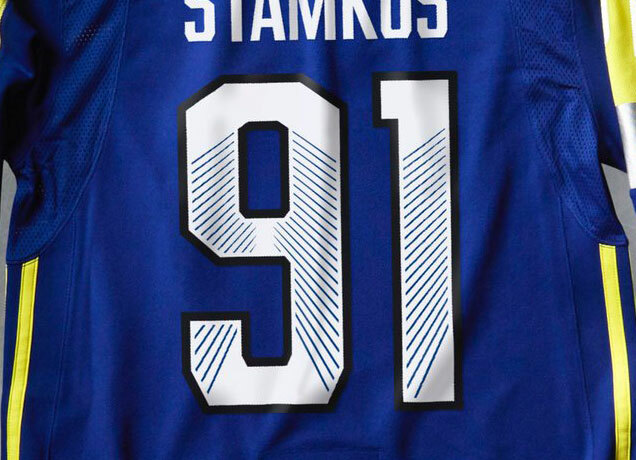 The downside is that, aside from the Atlantic jersey, nobody is going to mistake these jerseys as being minutely visually-related to the Tampa Bay Lightning. TL;DR: While the dull, monochromatic base colours (Atlantic jersey aside) are somewhat offset by the bright “energy” colours, these don’t look Bolts-related in the least. Not necessarily a big deal, but if that’s what they’re at least kind-of trying to do, it failed. The uniforms create a timeless aesthetic that simultaneously pays homage to the history of the league.…Creating a more contemporary and sleek aesthetic through bold color blocking, the uniforms are highlighted by a silver metallic film with four die-cut stars, one for each division, that allows the body fabric to show through. There’s a thin line between timeless and nondescript, which is really just a nice word for boring. These straddle that line adeptly, but just don’t have enough impact or visual interest to be that appealing in general. True, the large blocks of colour – especially the brighter colours that fill those blocks – help give the jerseys some character. And the strip of metallic film on the sleeves (a more experimental fabric for a hockey jersey) is tastefully done, and is the perfect place to place the stars. But, they’re still jerseys that are pushing the modern, minimalist approach too far, barely staying away from being boring by implementing a few strategic bursts of interesting elements. 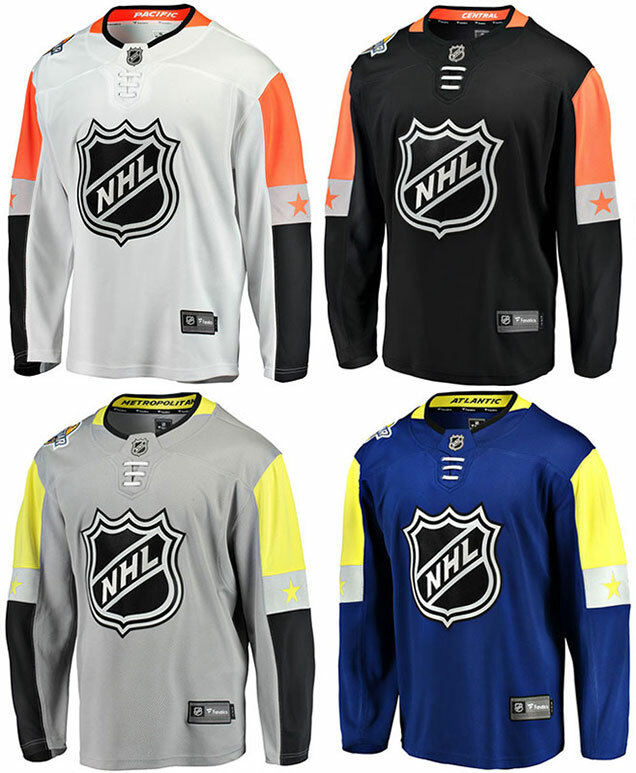 The league seems so intent on pushing this modernist, colour-blocked aesthetic that they’re sucking out any opportunity to have some fun and take some risks, especially for jerseys that are for something like an All-Star Game, a forgettable annual event that is more of a party/celebration than anything. It’s a wasted opportunity to really try something new and interesting. 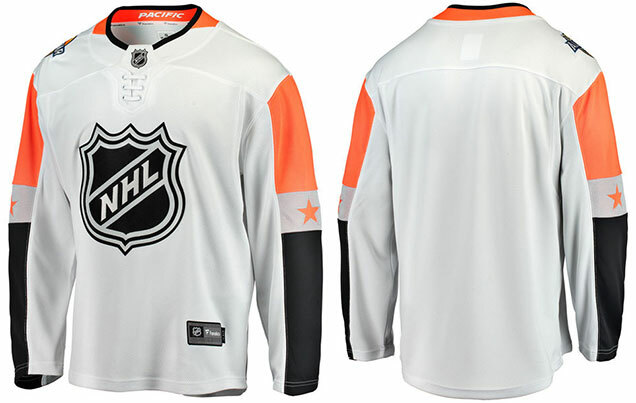 All considered, the design of these jerseys aren’t great, but they’re far from bad. They’re…just fine. They’ll serve their purpose very well and then be mostly forgotten. However, I have no idea how they considered that these jerseys “pay homage to the history of the league.” Because the league’s logo is on it? Because they have laces on it that don’t actually serve any purpose? 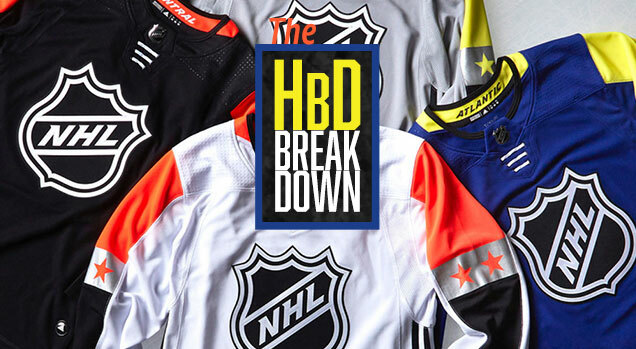 Don’t let NHL.com fool you, these are ultra-modern, contemporary jerseys. From the bright “energy” colours, to the metallic film on the sleeves, to absolutely no colour of any sort at the bottoms of the jersey, to the pattern in the numbers. Accenting the color palette and jerseys, a custom-designed number font was inspired by the suspension cables of the Sunshine Skyway Bridge, a Tampa Bay landmark. I really like this element being included in here, but they’d be improved if they were more subtle. Otherwise, it’s a nice touch. Oh, and there’s the Adidas tri-stripes up the side. *eyeroll* Whatev. Now let’s take a look at each specific jersey. Obviously, the design of each one is generally the same, so these will focus more on the specific colour applications. Oh, and the inclusion of the division name on the inside of the collar? A very nice subtle inclusion. Aka, the white jersey. For me, it’s the 3rd best jersey of the four. It’s mostly monochromatic with not enough “energy” red to compensate. And then there’s the harsh contrast of the black on the lower sleeves against the white is way too aggressive, pulling the eye where it shouldn’t go, making the whole jerseys unbalanced. 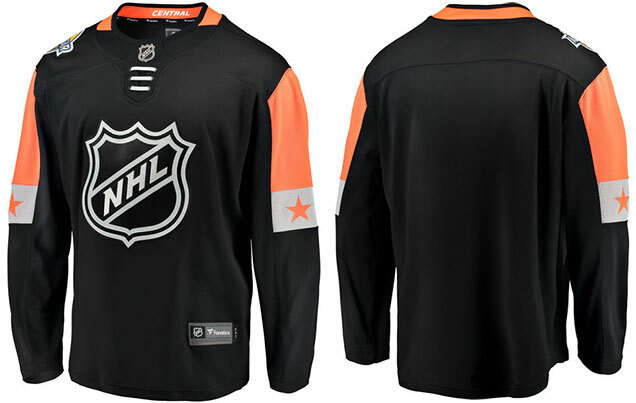 But, it’s on these jerseys that the silver stripe of stars works best, because the red/orange provides enough contrast against the silver and the addition of a block of colour that continues down to the cuff gives it a better sense of placement. Aka, the black jersey, and also my least favourite jersey. It has the same boring level of monochromaticism (sure, that’s a word, why not) as the Pacific, but with even fewer elements to help bring some character and energy to them, since the blocks of colour on the sleeve end at the silver stripe of stars. And yes, there’s not that distracting contrast on the sleeves that the Pacific jersey had, but at least they had something more to look at. For both the Central and Pacific jerseys, they could’ve used some of the “energy” yellow brought in somehow, to give it more character overall. Especially since these colours were a sunset-themed idea, you could’ve had some more fun with it. I know I punished the Golden Knights for having grey jerseys (which I’m still not a fan of, no matter how good they’re doing this season), but this lighter shade of grey, in combination with the intensity of that yellow…it actually works. It’s energetic and refined at the same time. It punches you in the face, but gently, like a 2-year-old punching you in the face. The black chunk on the sleeves works better here than on the Pacific jerseys because the contrast on the grey is less than against the white. 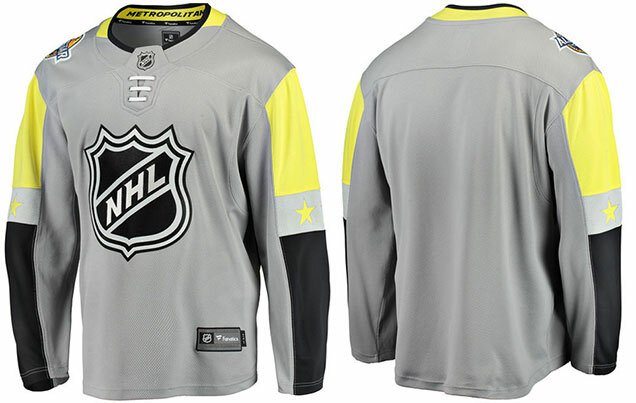 The biggest detriment on the Metro jerseys though is the silver stripe. Silver on grey just doesn’t give enough contrast to give the full effect of the silver film, and it just gets a bit lost in the shuffle, especially since the yellow stars don’t have the same amount of contrast on the silver than the Western Conference’s orange stars. Aka, the blue jersey, and the best of the bunch imo. For one, there’s more than one colour on it, with a great blue and yellow combo. Two, it’s easily the most Lightning-esque of all the jerseys, which is probably why it’s the Atlantic division (aka the Lightning plus a few other players) that’s wearing these jerseys. Three, it’s easily got the most visual energy and impact. 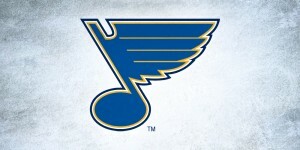 While they could’ve used the black block of colour on the bottoms of the jersey to balance the black around the collar (which is oddly the only place other than the logo crest that black is used), especially since the blue jersey would’ve create the least amount of contrast for it. 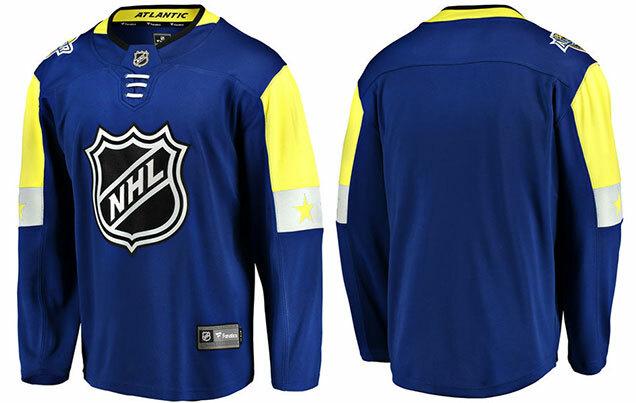 These jerseys are a disappointment, but just because they feel like a missed opportunity to push the envelope of jersey design a bit, and the All-Star Game is the perfect place to do that. 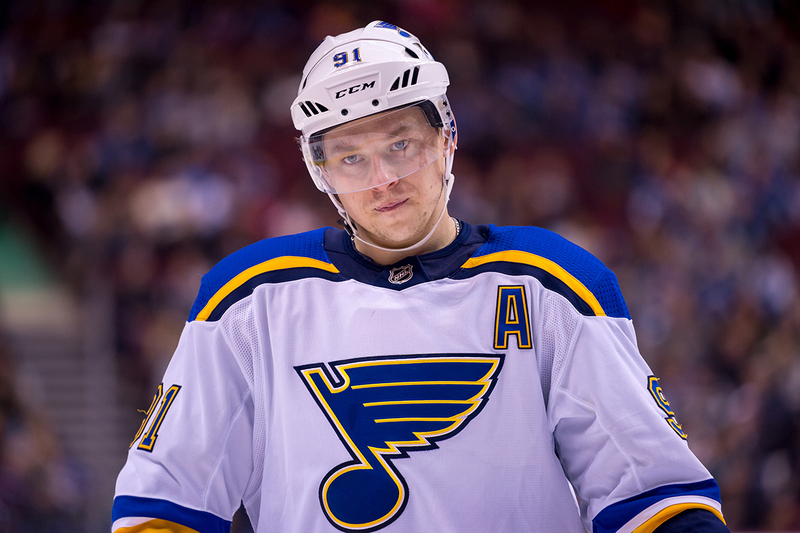 Instead, the NHL stayed on its colour-blocked path of minimalist jerseys that brought in some interesting elements, but nothing that will ensure these jerseys get remembered or celebrated in a positive or negative way. 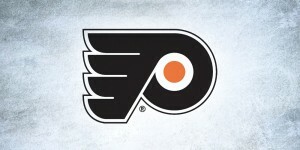 @JDVW what did you think of the pacific division’s white pants? That’s pushing the envelope for me. 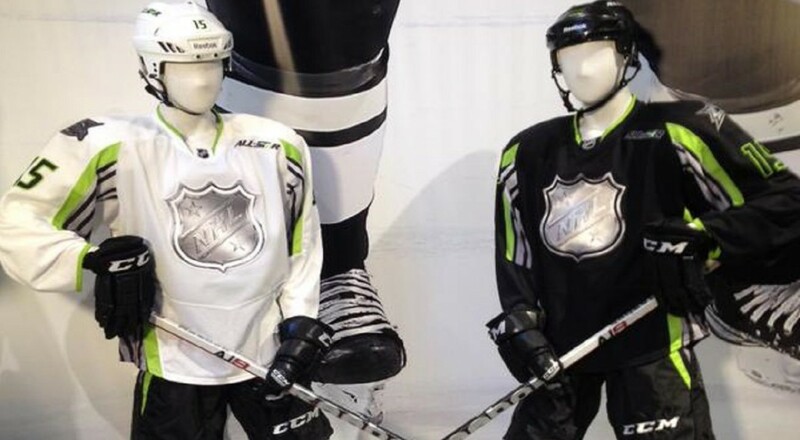 I actually think it worked well, unlike the Kings 2014 stadium series uniforms. I like how, with the exception of the Metropolitan division, all the teams went mono-colored, but it surprisingly didn’t look like pajamas *ahem previous Hurricanes unis*. Yeah, wasn’t crazy about the white pants. Almost all-white uniforms on a sheet of white ice looked bad imo. They also made the various logos on the pants stick out way to much, especially the black Adidas one. But maybe that was part of the plan. I was surprised by that too actually. The Metro needed some more yellow somewhere on the uniform, but the black pants was a good choice. P.S. When are you going to rip apart the Olympic jerseys? Thoughts on AHL all star jerseys? Red vs Green was a bad choice, as no colorblind fan can tell the difference. Each one individually were really nice, however. They obviously had a much more classic aesthetics which was nice, but not incredibly interesting or innovative. But, lots more colour and much better balanced, which are huge plusses, aside from the red vs green issue for accessibility.